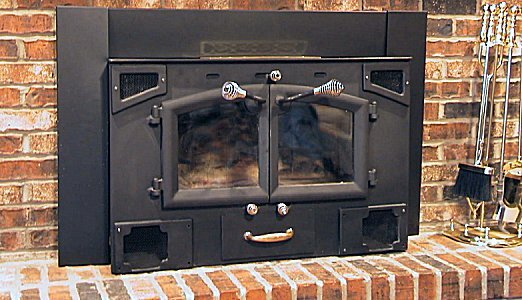 Trying to identify the manufacturer and approximate time frame for date of manufacture for this fireplace insert. The insert is approximately 23" tall x 35" wide x 22" deep. Originally had a 4" x 12" rectangular hole in the top for the flue. The brass vent on top (which is reflected in the surround) is not original...we added that for extra air flow around the firebox. I have looked all over the unit for a manufacturer tag or insignia, but have found nothing. If you think you might know who made these and/or when feel free to e-mail me or post back to the Hearth Net.